Can someone explain to me what rollover interest is? I’m talking about getting a “helmet” explanation here, thanks. Is Spot FX Trading Foolish? In a very simplified way we can say that In the “real” world, bank account balances are only addressed at the close of the day. For example if a bank account holder has a negative (short) position in, say, USD then they will borrow funds overnight to balance their account on each close of day. Similarly, if an account holder has a surplus in their account then they will lend it out overnight. These overnight funds have an interest rate cost to the borrow, and a gain to the lender. The same applies to our positions with our broker if we wish to retain an open position overnight. Intraday trades are not affected by this as they are closed out before the end day balancing process. "The minimum level of commitment required in order to get out of bed in the morning and switch on the computer" - I know, that a bit facetious really, sorry! Okay, so for example let’s just say forwhatever reason I’m going long with USD/GBP and if the interest rate is higher for the USD, then I benefit from that, but if the interest rate is higher for the GBP, I lose money. Hope I’m picking up what you’re putting down. Appreciate the response. @okarin_niqqa first, it’s important to note the currency pair comparing the exchange rate between the US dollar and the British pound is always written as GBP/USD, never the other way around. If you believe the British pound will rise relative to the US dollar, then you can buy GBP/USD. If you believe the pound will fall relative to the dollar, then you can sell GBP/USD. If you sell GBP/USD to open a trade, then you are in a short position. You are short GBP and long USD. In this scenario, you would indeed earn rollover interest, if you hold the position open through 5pm New York Time which marks the cutoff between the end of one 24 hour trading day and the start of the next in the global forex market. 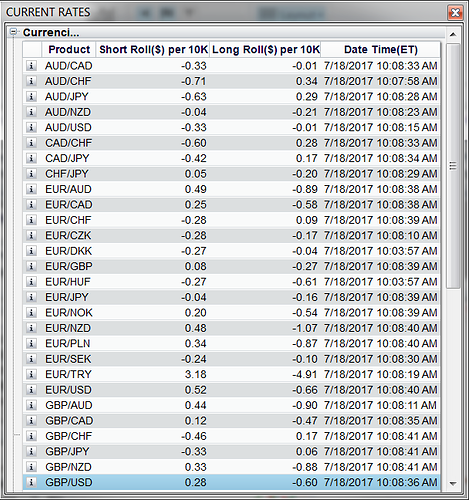 The screenshot below is taken from the Current Rates window of our FOREXTrader platform. It shows you can earn 28 cents in rollover interest for holding a mini lot (10K) short position in GBP/USD today at 5pm. That’s about $2.80 for a standard lot (100K). How can a swap value be positive? Interest rate is an annual cost of borrowing money. Rollover interest (swap) is roughly 1/365 from interest rate + market or broker costs (applied to prevent traders from arbitrage). 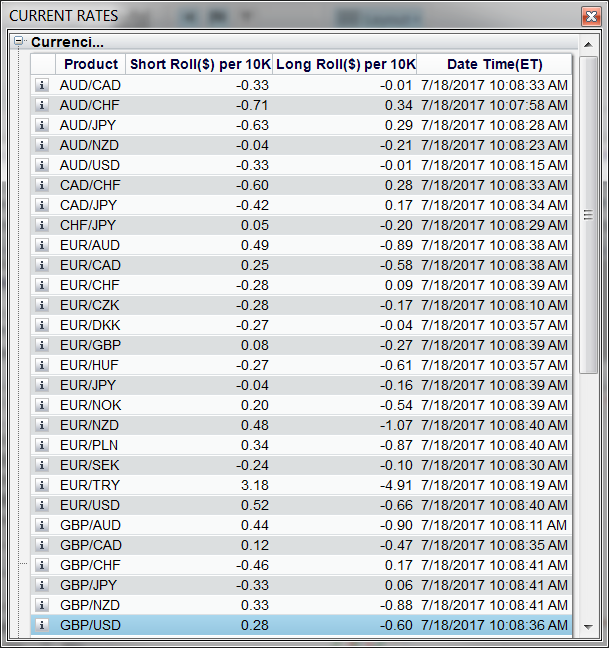 Still trading pairs with high rate difference and low volatility you can earn low-risk swaps easily. "Interest is PAID on the currency that is borrowed. Interest is EARNED on the one that is bought." So in the case of shorting GBP and longing USD, I’m earning interest because the interest rate is higher for the USD, am I correct? But let’s just for example I was longing GBP instead of the USD, I would be paying interest instead, right? Sorry if my question is confusing, but it’s the wording in the quote above that confuses me. You earn rollover interest on the currency you are long. You pay rollover interest on the currency you are short. If you are long GBP/USD, then you are long GBP and short USD. If you are short GBP/USD, then you are short GBP and long USD. So in the case of shorting GBP and longing USD, I’m earning interest because the interest rate is higher for the USD, am I correct? But let’s just for example I was longing GBP instead of the USD, I would be paying interest instead, right? Yes, you have understood this part correctly. Since USD has a higher rollover interest rate than GBP, you earn rollover interest overall on a short GBP/USD position, and pay rollover interest on a long GBP/USD position.